try to send something to you from my mailbox. the species and varieties where the name is missing if you have time. This aroid I have had for decades, but only in itsjuvenile form. Now it has emerged into full sun and adulthood. Could anyone say what it is? I tend to think it’s a Raphidophora orEpipremnum. Second picture shows juvenile form. The pics look like the Rhaphidophora decussiva I have. This aroid I have had for decades, but only in its juvenile form. Now it has emerged into full sun and adulthood. Could anyone say what it is? 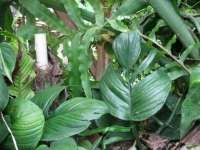 I tend to think it�s a Raphidophora or Epipremnum. Second picture shows juvenile form. university plant has bloomed in the past, but I did not get a picture. Any help in an ID would be appreciated! This aroid I have had for decades, but only in its juvenile form. Now it has emerged into full sun and adulthood. Could anyone say what it is? I tend to think it's a Raphidophora or Epipremnum. Second picture shows juvenile form. Your plant looks a lot like a cutting I have (see attached picture) of a plant at the University collection. It is ID�d as a Rhaphidiphora. The university plant has bloomed in the past, but I did not get a picture. Thanks very much Sherry. John. The picslook like the Rhaphidophora decussiva I have. This aroid I havehad for decades, but only in its juvenile form. Now it has emerged intofull sun and adulthood. Could anyone say what it is? I tend tothink it’s a Raphidophora or Epipremnum. Second picture showsjuvenile form. Thanks verymuch for the picture. However I think it recalls Raphidophora decursiva, whichI also have. I must compare your picture with it. John. 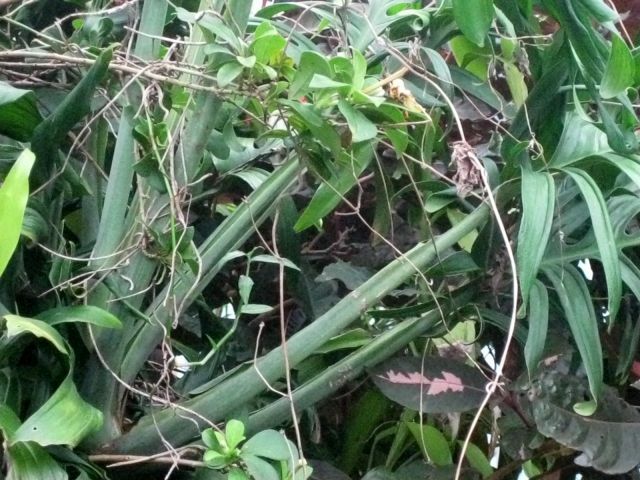 Your plant looks a lot like a cutting Ihave (see attached picture) of a plant at the University collection. It is ID’das a Rhaphidiphora. The university plant has bloomed in the past, but I did notget a picture. Thank you very much Conrad. I also felt you might be able to identify HarryWhitmore's anthurium. It puts me in mind of one growing on Dominica, or isit A. cordata? 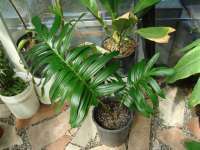 Your pictured plant looks like what has been called Monstera pertusa orperuviana. I don't know what its official name is. I too have hadit for decades; it is now growing up a Ceiba (silk cotton) tree and forms nicefan-like rosettes of leaves at maturity. > tend to think it's a Raphidophora or Epipremnum. At first I wasdistracted by your spelling of “decursiva” but in fact I do alsohave R. decursiva and the plant I showed differs from it. Thank you very muchanyway. John. As I have indicated to others who were kindenough to answer my query, the plant in question differs considerably from R.decursiva. 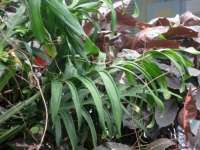 I have both R. decursiva and Epipremnum pinnatum. 2.5 m in leaf length. Thank you very much for your input ! 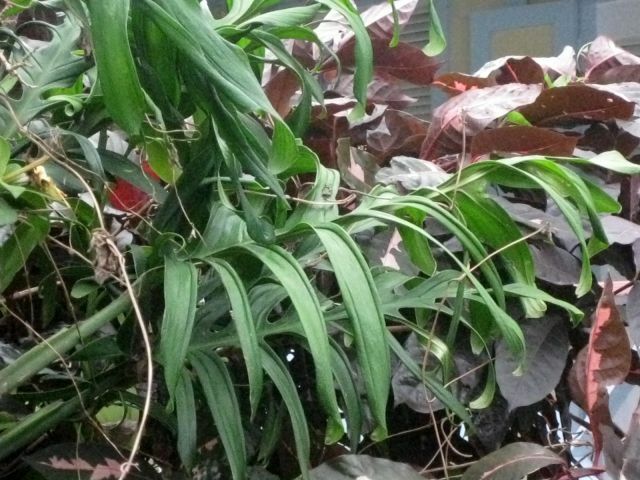 (mine originally came as a big cutting from the HBV - the BoatanicalGarden of Vienna / Austria, where it grows more then seven meters high in thetropical greenhouse). For a long time I thought it was Epipremnum pinnatum,but from Peter Boyce I have learned the difference. Presently I do grow both,the Raph. and the Epi., to be introduced to the European market. 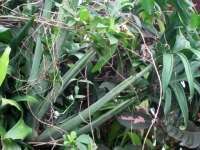 PS: Becareful, the adult leaves get more then 2,5 meters long. > An: "'Discussion of aroids'"
> picture shows juvenile form. Your plant looks a lot like a cutting I have (see attached picture) of a plant at the University collection. It is ID’d as a Rhaphidiphora. The university plant has bloomed in the past, but I did not get a picture. This aroid I have had for decades, but only in its juvenile form. Now it has emerged into full sun and adulthood. Could anyone say what it is? I tend to think it’s a Raphidophora or Epipremnum. Second picture shows juvenile form. Thanks very much for the picture. However I think it recalls Raphidophora decursiva, which I also have. I must compare your picture with it. John. It's hard to say but It looks a little like one Im growing called Monstera dissecta, although there are several Monstera and Rhaphidophora which have similar looking leaf blades. Maybe Pete or Tom could comment? paper has never been published and the project has quietly died. By the way, are you familiar with a vining Anthurium from the eastern Caribbean, with pedate leaves, called, appropriately enough, Anthurium pedatum? I vaguely recall seeing it in your nursery years ago. > Thank you very much Conrad. > puts me in mind of one growing on Dominica, or is it A. > fan-like rosettes of leaves at maturity. > > tend to think it's a Raphidophora or Epipremnum. Just checking - what does everybody have for sale at this point? This forum seems profoundly quiet - I figure everybody is baking in this heat, as I am. Any input on my weird amorphophallus bulb would be great. I also picked up a NoID Shismatoglottis a couple days ago - no picture yet - but it seems distinct - dark green leaves, but with subdued silver blotches (not bright at all) - and burgundy petioles. Any idea? (Leaves are just like an Aglaonema, but softer. One reason people come to the annual IAS show is that it is a place to acquire rare plants at very attractive prices. Every year the array of commercial aroid offerings on the show floor is unsurpassed by any other venue. And the best thing is that you can speak directly with the vendors, availing yourself of their expert opinions, and pick out the specimens you like best. What's more, when you buy them, you have them right there in your hand. No need to wait and worry about when they might arrive at your house and what shipping travails they may have experienced in transit. A bird in the hand, as they say. Then, there's the auction. The auction is the place to find really one-of-a-kind plants, and sometimes two-of-a-kind plants. Prices have been historically what one might call a "steal", although some of us are working hard so that prices in the future will be boosted by attracting more bidders. So this year might be your chance to secure astonishingly rare plants at very modest prices. Auction details will be available, as they become known to us, on the IAS website. Rare plants. Isn't that the reason you're a member? Get them at the show.